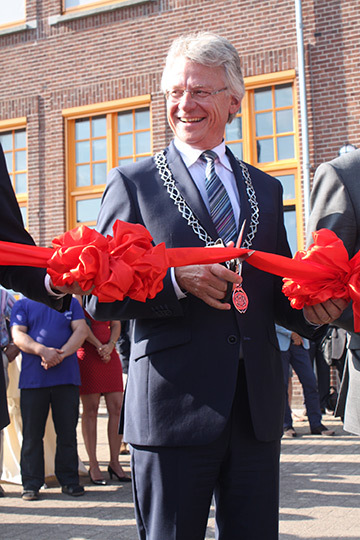 The mayor of Apeldoorn, John Berends, will be one of the speakers at the Giro Fiets Campus hosted by Wittenborg University at its Spoorstraat location this Saturday, 12 March, from 13:00 – 16:00. The event serves as forerunner for the 2016 Giro d’Italia, one of the biggest cycling races in the world, which will kick off in Apeldoorn on 6 May. Berends, who also opened the Spoorstraat Building last year, will be speaking at 13:30. Other prominent guest speakers on Saturday will include Dr Gary Brickley, who coaches Britain’s Paralympic Cycle Team, as well as Remy de Wit, head coach of the Dutch Women Basketball Team. At the Paralympic Games in 2008, Brickley’s team won 8 gold and 1 silver medal. At the invitation of Wittenborg he will talk about the preparation needed to win paralympic gold in cycling. Brickley is also a senior lecturer at the School of Service Management and Sport, part of the University of Brighton, Wittenborg’s main education partner. De Wit in turn will provide insight on what can be learned from successful athletes. He will give a glimpse of an athlete’s life, the difficult decisions they sometimes face and what others can learn from that. The management of Wittenborg said it is delighted to be part of promoting the kick-off of the Giro d’Italia in Apeldoorn which will garner international attention for the city, and hopes it will give an excellent start to its new joint programmes in sport. “We have daily interactions with international contacts and the almost 500 students studying at Wittenborg represent more than 70 nationalities,” says the CEO of Wittenborg, Maggie Feng. “In October 2016 we will start a master's programme in Sport Business & Management which is a new programme taught entirely in English for Dutch and international students.” According to Feng, the IBA in Sport Business & Management will lead to the master's degree. The programme is being offered in collaboration with the University of Brighton in the UK. Full-time as well as part-time studies will be possible. During the Giro Fiets Campus lectures will be alternated with practical workshops and experiments. Local businesses will present products associated with cycling or Italy – like pizza! There will also be an opportunity to try out a variety of bikes or try on cycling gear. Visitors will get a free taste of a pink pizza, freshly baked in a traditional wood oven. The aim of the Giro Fiets Campus is to share scientific knowledge about cycling as a sport, the economics by which it is run and well-being in general. Of course, it also aims to raise awareness and excitement among the residents of the Gelderland for the start of the Giro d’Italia in their own region. The Giro Fiets Campus is held in cooperation with Wittenborg, Radboud University and the Hogeschool Arnhem Nijmegen (HAN). Its first edition will be held this weekend, 5 March, in Zuthpen with another on 19 March at dok Zuid in Apeldoorn. More information on the Giro d’Italia can be found here.